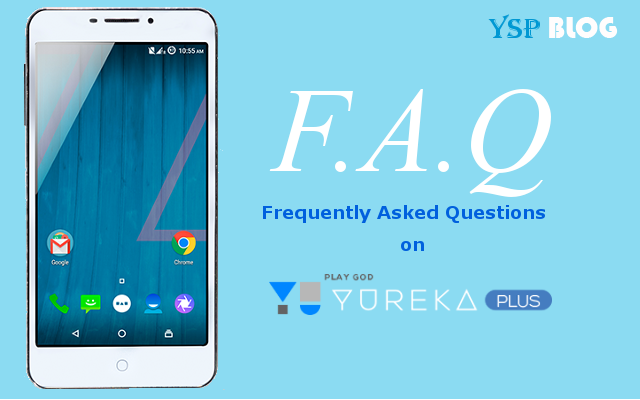 This page contains FAQs on the upcoming YU Yureka Plus. The FAQs have been based on the questions we have been asked on our Facebook Page. If the answer you're looking for is not available here, please leave a comment here or on our FB Page or email us at info@yurekasupport.com. Important Question : What's the price of Yureka Plus? Answer : The price of Yureka Plus is ₹8,999 only. 1. When and where can I get the Yureka Plus Phone? Ans : Yureka Plus is available exclusively on Amazon India website on a pre-registration basis. It is on sale every Wednesday at 12 PM. Ans : You can register here: Yureka Plus Registration Page. 4. How many units are available per sale? Ans : Number of units for the sale ranges from 10,000 units to 30,000 units per week. 7. What are the modes of payment? Or, Is COD (cash on delivery) available on Yureka Plus? 8. Is EMI option available on Yureka Plus? Ans : Screen size is 5.5" Full HD (1920x1080) display. Pixel density is 401 ppi. Ans : Yes, it comes with Corning Gorilla Glass 3 with oleophobic coating. Ans : ROM or internal storage is 16 GB. 12.5 GB is available for apps and mass storage. Ans : It has 2,500 mAh removable battery. 13. What's the weight of the Yureka Plus? 1. Tell us about the camera in Yureka Plus. Ans : 13MP Auto Focus Rear and 5MP Fixed Focus Front Cam.